Project Owner Notes: I HAVE this chandelier. It's so typical of my style - a mix of rough plumbing pipes with beautiful delicate crystals hanging from it. I would LOVE to have this over the couch somehow. Project Owner Notes: I LOVE the colors of this bedroom (and would love to use them in mine), but I attached this photo because of the overall "feel" it gives me. It's sleek, modern, but warm! Project Owner Notes: Uploaded this because of the nice clean look and feel of it. Also, I LOVE texture and the boxes on the wall are not only good for storage, they are artistic, and somewhat unusual. Project Owner Notes: See the note on the file itself. This is NOT from the manufacturer of the new couch I bought (not yet delivered), but an approximate from a picture of a fabric I had saved on my computer. Project Owner Notes: Remember I said I LOVE texture, I LOVE this 'concrete wall" - I would want it only on one wall maybe. Resource Furniture in Manhattan sells it. I know the owner, we've bought stuff there before. Very expensive store, but maybe something like this could be found elsewhere? Project Owner Notes: Saw this in Roche Bobois store in NYC a year or two ago. Like how there is lots of storage, but it doesn't look like every other wall unit /tv holder. 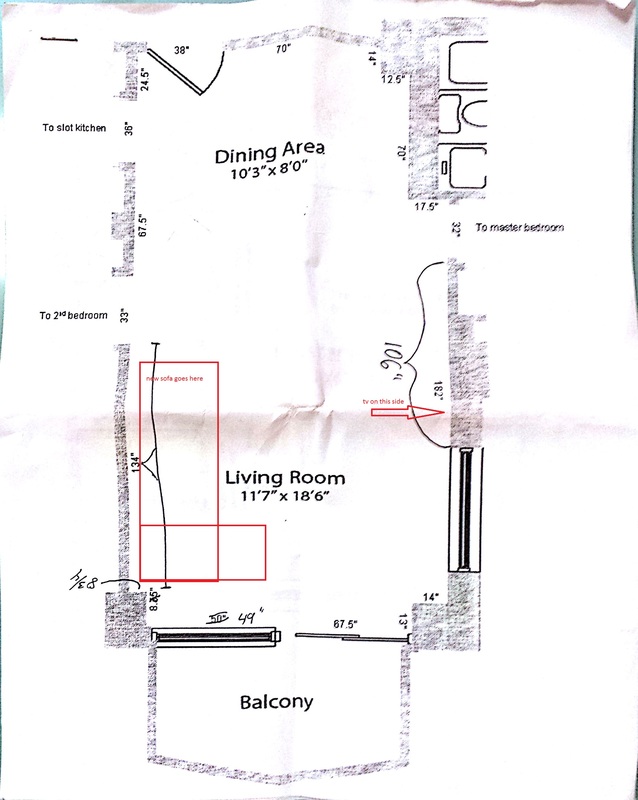 Project Owner Notes: Hope you can read this - my condo dimensions as per the original floor plan given to us when we bought it. Not terribly fond of the chain stores. Love very unique things. 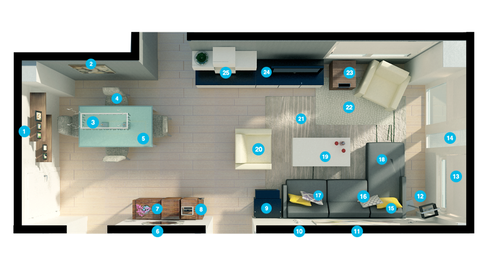 I uploaded a jpeg of the dimensions of the room as per the offering in the condo bylaws. 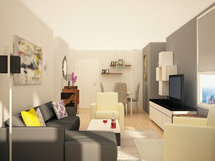 - I want to make it look "lighter" more spacious, less dense, and less dark!!!! -I'd like a new TV / wall unit, rug(s), coffee table, maybe an occasional table (small) and maybe - if it fits, some sort of "server" around the dining table. Also need window coverings of some sort. NOTE - the windows need to be discussed in more detail - they are strange! Definitely new art and accessories. -I don't like the color of the legs on the dinning room table. Can we paint that a different color? Maybe something like a silver or chrome like color to match the part of the base that is the mechanism for pulling out the leaves? I'm not in my apartment as I write this, but I think it's basically chrome, so perhaps something to match, or, something totally different that I can't think of right now? Dinning room table by Tobin Casa out of Italy - 63"l by 30"h by 35.5"w, dinning chairs 41.5"h by 25"d by 18"w, Adagio table lamp, club chairs 26"w by 30.5"h by 28.5"d, new sofa ariving by Natuzzi Temore Dark Gray Microfiber, TV (optional, might get new one) Samsung LN40A650A1FXZA, 42" Tribeca Banqueting Chandelier by Michael McHale Designs (optional), artwork attached. 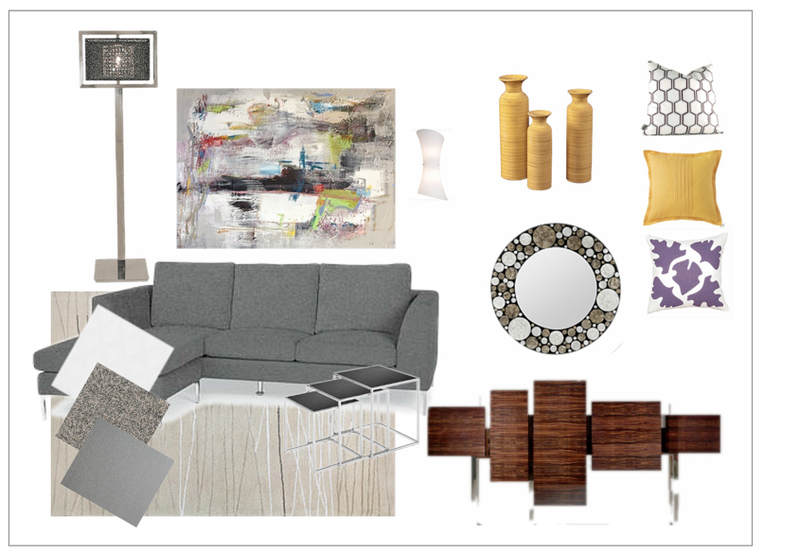 Measurements for existing art and new Natuzzi Tempore sofa (dark gray microfiber) coming soon. The floor plan has been updated as well. I'm so glad you like it. It's been great working with you, Debra! 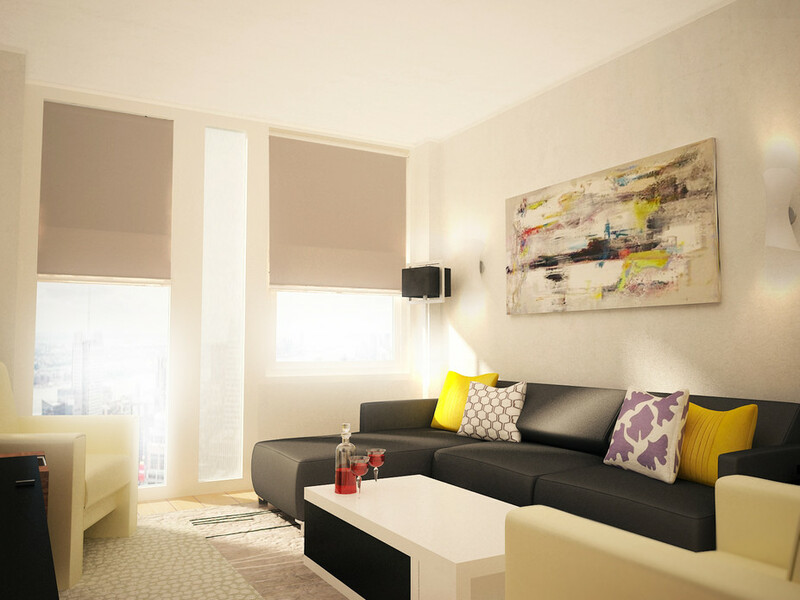 Since your room is smaller using a dark and rich color will make it feel cozy, warm, and lounge-like. 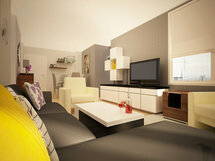 Selecting a rich gray paint or wallpaper does this while allowing your lighter furniture and wood flooring to stand out. For your main color, we chose to use gray because it is neutral and seen as classy and modern. 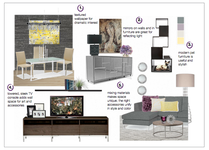 It compliments many colors such as white, lavender, and yellow and works well as part of a color scheme in any room. Eurostyle Barbie Shelf (SKU#: EY1437) The light weight construction of these chic shelves makes them able to be used just about anywhere in your home! Sleek and unobtrusive, use them to hold your favorite paperbacks or display classic family photos. The honeycomb construction of the product can handle almost anything you decide to display Discount link available to project holder only 43"
Notebook nesting tables (2 nesting table set) Black lacquer perfect for any place in the room. Do not have to necessarily place books on top. Could hold just about any accessory. Discount link available to project holder only Large Table - W22" H22" D15" Small Table - W20" H21" D14"
ET2 Conico 2 Light Wall Sconce (SKU #: ETL1058) Bright light sconce with a very clean, modern look. Gives unique good quality light. Discount link available to project holder only 20"x9"x3"
Modern art painting Beautiful canvas painting that really complements the rest of the room decor. One of a kind! Discount link available to project holder only 60"x48"
Floor lamp (Chloe (1) #2337) Has a nice polished silver w/ black mesh shade. Supplied with a full range dimmer Each framburg lighting fixture is hand made in the U.S.A. Discount link available to project holder only 14 sq." x 62"
Emma Jeffs Pixel Adhesive Film (pixel pattern) Film for window. Perfect on any smooth, clean glass or mirrored surface the film is not affected by condensation or indirect water spray, so it's an especially perfect solution for bathrooms. If removed the film will not damage glass in any way. Discount link available to project holder only 95 3/8" x 19"
Company C Harper Linen Pillow (SKU #: JXX1464) This Harper pillows is detailed with pintucked pleats. Handcrafted in the USA. Discount link available to project holder only 22"x22"
Inhabit Estrella Plinko Synthetic Pillow (SKU #: INH1508) Made from 100% sustainable recycled polyester Environmentally-friendly inks with no chemical waste or disposal generated Recyclable at the end of its life-cycle Zipper closure for easy removal and cleaning Pillow inserts are 95% feather / 5% down Discount link available to project holder only 18"x18"
Balanced Design Hand Printed Shade Pillow (SKU #: BDN1011) lavender + white printed pillows. Crafted of 100% off-white linen Made from recycled plastic bottles Design in reverse on back Hand printed using water based inks Zipper closure Insert constructed from 50% regenerated fiber Discount link available to project holder only 16"x16"
coffee table (Hanno) Modern black + white coffee table. This coffee table features one of the most functional and original designs. 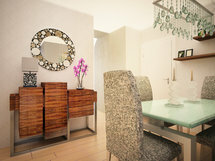 This is due to glossy black drawer box that can be swivel out from the under the table top. This glossy occasional table would perfectly fit into your modern design living space. Discount link available to project holder only W47" x D23.5" x H13.5"
Bashian Rugs Greenwich Ratna Grey Rug (QKD 1240) This New Zealand tufted rug has contemporary patterns in updated colors, highlighted by shimmering viscose, gives this tufted collection a stunning appearance at an incredible value. Discount link available to project holder only 7'9" x 9'9"
Flatscreen TV ( LN40A650A1FXZA) Great flat screen tv in glossy black for just about any room in your home. Discount link available to project holder only 42"